Many (many!) years ago, Mr WB and I bonded over a shared desire to sail around the world together. As we got older, we realised this dream was crazy- mostly because we both get frustrated by sailing and I get horrendously seasick due to an inbuilt fear of deep water. Have I mentioned that I'm ex-Navy and used to be a competitive swimmer….!?!!?! The mind is a weird thing. Or maybe it's just mine…?? 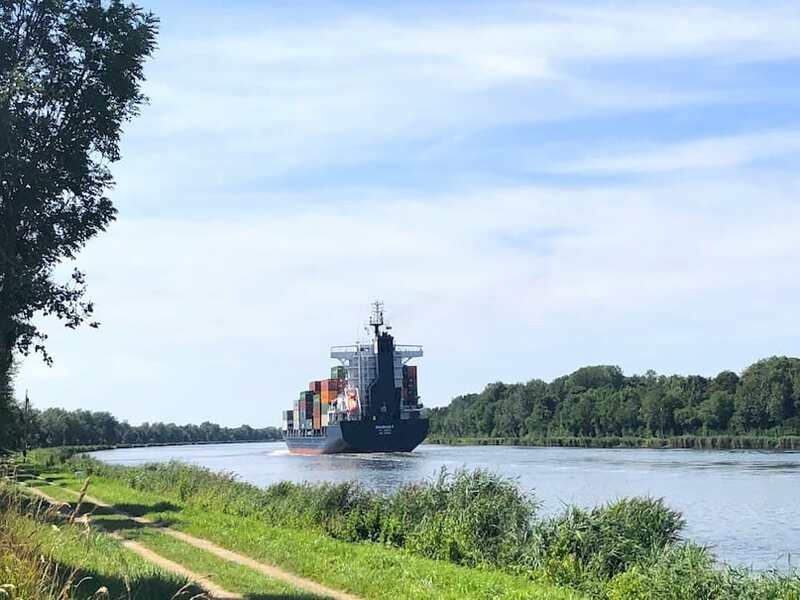 Anyway, one of the places I have always wanted to visit was the Kiel canal- the idea of travelling through that immense waterway always fascinated me and I loved (still do) reading stories from my favourite sailors about their tales of adventure around the Baltic. The day after we crashed a wedding in our swimwear, we set off reasonably early and headed for the Kiel Canal. It was a few hours drive- we thought were going to stop at Hamburg but decided to press on so we could have an extra night in Denmark. It's all a balancing act between too much time in one place versus less time somewhere else. I look forward to the day where we don't have these schedules any more. Having said that, they do keep us focussed and motivated to keep moving, which I guess is a good thing. There are a few wild camping options, but we decided to pay for a campsite on the edge of the canal so we could charge our batteries and get everything sorted before we headed into the wilds of Denmark. We also needed to do some work, which meant we wanted to stay a little longer in the morning- not easy in a wild camping spot, as we learnt in Belgium! It cost 12€ for the night, plus electric. We put 3€ into the electric meter and it didn't run out throughout the night, so that was good. There is also a small grill/ bar which serves Bratwurst and a few other things between 5pm until 6.30pm. Unfortunately, we arrived too late to enjoy any of it, so we enjoyed couscous and chicken for dinner. If you're looking for some easy road trip meal ideas, these might help. There are full facilities at the campsite, which cost 1€ for fresh water and 1€ for toilet disposal. There's also waste water emptying and a refuse bin. And now we're off into Denmark! A new country to add to our map. Have you ever been to the Kiel Canal? What did you think of it? Don't forget, sharing is caring! If you enjoyed this post, feel free to share it on social media. Your actions really do make a difference- thank you! Super lively blog, read all of it on the ferry from Ireland! Can you tell me who gave your van such a great makeover please – mine was sourced from the same company with the same green logos. In return, I am buying you a coffee! Hi Paul and welcome! Firstly, thank you so much for your donation to our coffee addiction- we really appreciate it! We got ours wrapped by Monster wraps in Hedge End, near Southampton. (I should probably charge them for advertising! 🙂 ) We were really pleased with them- although they weren’t cheap! Are you planning any adventures in your van? Funnily enough, that’s what happened when we went to Scotland! Isn’t it nice being able to change your plans to go with the sunshine!